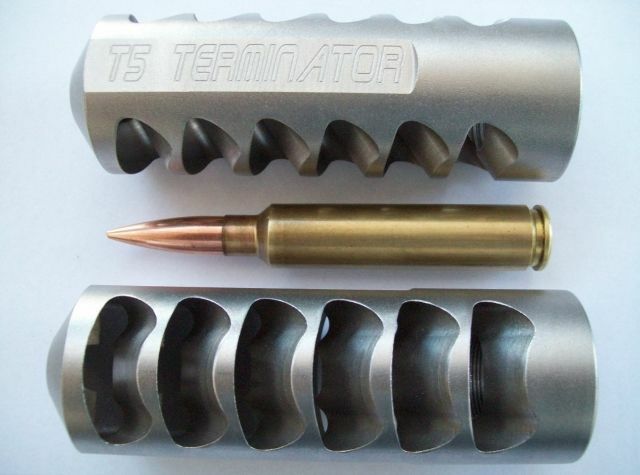 I have redesigned the T5 Terminator muzzle brake to bring it into line with the rest of my range of brakes. It’s primarily aimed at Cheytac type capacity cases. Here is next to a 350 SMK in the 375 DCM. The dimensions are, 1.5”, 38mm diameter, 4.46”, 113mm long & weighs 12.7 – 13.8 oz, 360 – 390 grams. Spanners, Terminator and rogers.270 like this.